1. Start with the yogurt. 2. Place a fine meshed sieve on top of a bowl. The sieve should not touch the bottom of the bowl, there should be some space left in between the two. Place a very clean kitchen towel or cheesecloth on the sieve and pour the yogurt in there. Gather the ends of the kitchen towel and cover the yogurt with them. Place the bowl with the sieve in the fridge and leave it there for at least 5-6 hours or ideally overnight. You can throw away the strained liquid once during this time, so that it doesn't touch the yogurt in the sieve. 3. When ready to serve, turn the strained yogurt into a clean bowl and add brown sugar and vanilla extract to taste. Stir well and leave for a while. The brown sugar that I use is quite rough and it takes a while for it to disolve into the yogurt. By waiting a bit you avoid adding too much sugar. Don't forget that the cherries are sweet as well, so don't exaggerate with the sugar. 4. Preheat the oven to 200 degrees Celsius/ 390 degrees Fahrenheit. 5. 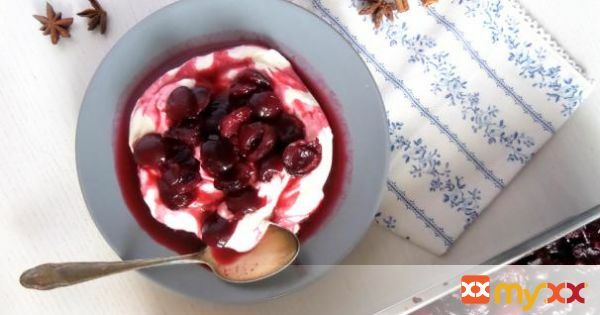 Place the halved cherries into a roasting tray, add the sugar and mix gently distributing the fruit evenly on the tray. Add the split vanilla bean, the cinnamon stick, star anise and cardamom seeds. Let the fruit marinate for about 10 minutes. 6. Squeeze the oranges and mix the juice with the elderflower syrup. If you don't have any elderflower syrup, you can leave it out or replace it with some other syrup. I can imagine that caramel syrup would be good in this combination as well. Pour over the cherries and mix well. 7. Place the tray in the oven and bake for about 15 minutes. Stir well, distribute the fruit evenly again and continue baking for another 15 minutes. 8. Serve hot or cold on top of the strained yogurt.